The question and the answer are so important we’ll spend this entire episode of The 5 tackling a single subject — something we haven’t done in well over a year. Let’s begin with a point we can all agree on: The United States has been in a persistent economic funk ever since the Panic of 2008. “The U.S. economy has grown about 2% per year since 2009,” says Jim Rickards. “This rate is below the economy’s potential growth of 3%, and well below the pace of past recoveries. While the federal budget deficit and the national debt haven’t made big headlines in recent years, the problem hasn’t gone away. Indeed, it’s only grown. Why haven’t we heard much squawking about the deficit and the debt? A lot of it has to do with the ultra-low interest rates we’ve experienced since the Panic of 2008. That year, the national debt totaled $10.02 trillion. Interest expense on that debt totaled $451 billion. A 10-year Treasury note yielded just shy of 4%. The Federal Reserve’s zero interest rate policies have been brutal on savers… but they’ve been great for Uncle Sam. Here’s the real problem: “While U.S. deficits have declined, they are still adding to the overall debt faster than the economy is growing,” Jim says. This fact is critical. It comes down to a concept called “primary deficit sustainability” that Jim wrote about in his second book, The Death of Money. The absolute size of the deficit doesn’t matter. What matters is the trend of the deficit as a percentage of GDP. “Think of nominal GDP [before inflation] as one’s personal income and the primary deficit as what gets charged on a credit card,” he wrote. Another point we can all agree on: The Federal Reserve’s efforts to lift the U.S. economy out of its funk haven’t worked. And the Fed’s remaining tools are of limited utility: The Fed missed its chance to raise rates in 2010–2011 so it could cut them now. The Fed could opt for negative interest rates, like they have in Europe and Japan now. But as we explained on Friday, negative rates appear to be backfiring: Rather than encouraging people to borrow and spend, people feel compelled to save even more than they did before. “Global elites are getting desperate to try something new to stimulate growth,” Jim goes on. We saw hints of that “something new” in December — when President Obama and House Speaker Paul Ryan cut a budget busting deal with $680 billion in “targeted” tax breaks for special interests. But wait, you’re saying: Won’t that only bring us closer to the moment of “fiscal crisis and loss of confidence in the dollar”? For answers, we have to go back more than 70 years. “Beginning in April 1942, shortly after the U.S. entered World War II,” says Jim, “the Fed agreed to cap interest rates on Treasury bonds to help finance the war effort. The cap meant that the Fed gave up its control of interest rate policy. Once the war was over, the Treasury was understandably reluctant to cede control back to the Fed; the caps weren’t lifted until 1951. But the precedent was set. “The Fed and Treasury will reach a new secret accord, just as they did in 1942,” Jim says. “Under this new accord, the U.S. government could run larger deficits to finance stimulus-type spending. “The Fed will then cap interest rates to keep deficits under control. Capping rates will have the added benefit of producing negative real rates if inflation emerges as the Fed expects. So that’s how the powers that be will “keep the music playing.” But what does that mean for you? Yikes. If you lend money today to the German government for 10 years, you get a pathetic yield of 0.26%. In other words, the 10-year Treasury yield would sink far below the record low of 1.4% reached in the summer of 2012. Remember, as rates go down, prices go up. “This will produce big capital gains in U.S. Treasury notes,” Jim says. But even if deflation persists, gold stands to benefit. That’s because “central banks such as the Fed cannot tolerate deflation,” Jim writes in his latest book, The New Case for Gold. Deflation is devastating for the banks, whose loan losses grow. And it’s devastating for the government; if people’s wages don’t rise, there’s no additional income to tax. “The Fed must have inflation,” says Jim. “They will do everything possible to create inflation. It’s what FDR did in 1933. “The U.S. government forced the price of gold from $20.67 per ounce to $35 per ounce. It wasn’t a case of the market taking gold higher; the market was in the grip of deflation at the time. 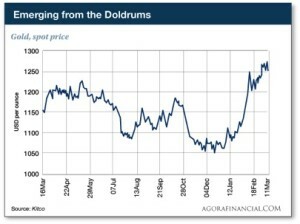 It was the government taking gold higher in order to cause inflation” — which it did. Jim didn’t plan for his latest book, The New Case for Gold, to be published at this moment. But the stars do seem to be lined up. The official release date is still three weeks away, but the book is already No. 2 in the Business & Money section at Amazon. Yes, you’ll learn why gold is set to thrive as the Fed enters a dangerous new era. But the book is also packed with how-to advice gleaned from Jim’s years of experience and extensive network of contacts. Should you store gold at home? How about overseas? Is it safe to buy online? What mistakes should you avoid? All these questions are answered in The New Case for Gold. You’ll also learn about Jim’s “mystical” gold buying formula that tells you how much you should buy. That information alone is worth several times the $16.66 that Amazon is charging for the book. But if you order from us today, you can get a signed hardback copy free — as long as you can cover the $4.95 shipping and handling. You’ll also get a no-obligation 60-day trial of Jim Rickards’ Strategic Intelligence. 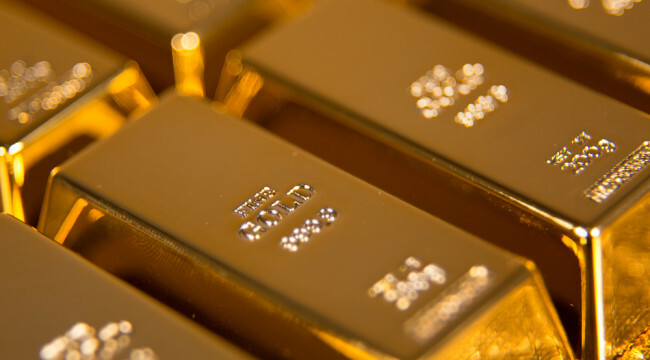 And you’ll have the chance to listen in on an exclusive intelligence briefing that details a bombshell about to hit the gold markets — drawing on information Jim’s learned from one of the most connected people in the gold world. It’s an unbeatable combination… and it’s available only at this link. Publication is set for Tuesday, April 5. We’ll ship the book to your door as soon as it comes off the press. Thanks for your forbearance today as we slogged through some complicated issues. But we know you’re wondering why the inevitable crisis is so long in coming… and whether it can be forestalled a while longer. Now you know, yes, it absolutely can. But you don’t want to wait to shore up your financial defenses. Take advantage of this window of opportunity. Jim’s providing the ideal playbook to get started. As always, we appreciate your continued readership. We’ll get back to regular programming tomorrow.